A magnitude 6.3 earthquake struck Indonesia's Lombok island on Sunday. 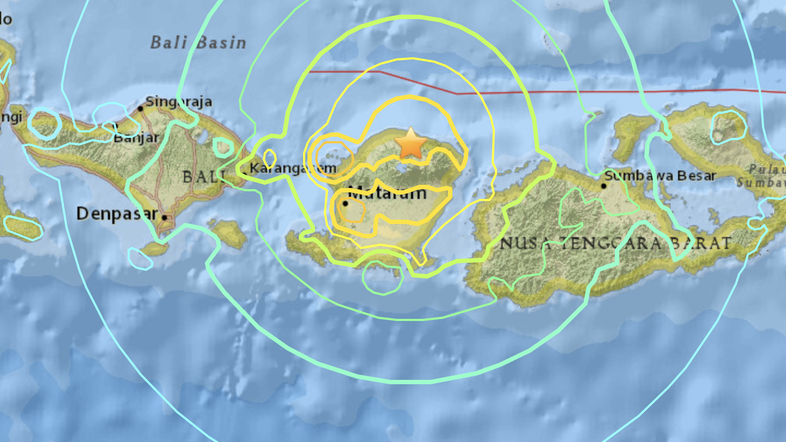 The quake was centered west-southwest of Belanting town in East Lombok, the US Geological Survey said, at a relatively shallow depth of seven kilometers. "I was driving to deliver aid to evacuees when suddenly the electricity pole was swaying. I realized it was an earthquake. The tremor was also felt in the island's capital Mataram and on the neighboring resort island of Bali. Earlier this month, an earthquake in Lombok killed at least 460 people, as hundreds of thousands of displaced people were still short of clean water, food and medicine. The shallow 6.9-magnitude quake leveled tens of thousands of homes, mosques and businesses across Lombok, just one week after another tremor surged through the island and killed 17. The hardest hit region of Lombok was in the north, where 334 people have died and nearly 200,000 have been forced from their homes, according to official tolls. Two people were also killed by the quake on the neighboring tourist island of Bali.